Not only are people behaving differently on mobiles than desktops, they’re also expecting different responses. eMarketer’s July 2012 Mobile Roundup notes that “the shift toward immediate ‘just in time’ information access means that marketers and content providers must meet demands for mobile-optimized content.” Responsive design has been the answer so far to multimodal users seeking immediately relevant, actionable, utilizable content. The average 13- to 17-year-old sends and receives 3,339 texts a month—more than 100 per day–according to Nielsen. Also revealing: decline in mobile voice and surge in popularity of text messaging across all demos. Last week Playdom’s acquisition by Disney closed. This week we spoke with Ben Chen, Head of Sales at Playdom, about SocialGaming’s mass adoption and future along with how brands can capitalize on the reallocation of consumer time in this space. To dimensionalize the opportunity briefly, with 45-minutes+ average engagement time, 100m US and UK players (over 200mm worldwide), and some early evidence that SocialGaming dynamics can change offline behaviors, this is a space marketers need to understand. Farmville, the first SocialGaming blockbuster, earns over 17.5 millon daily average users (DAUs)–only football, Obama interviews and a handful of other TV shows can garner that level of viewership–while delivering the kind of revenue that would put it on the top of Hollywood’s box office charts. To punctuate further, the 2010 Emmy’s earned 13.5 mm viewers and topped that week’s viewership charts. So think TV scale, Hollywood revenues and Gaming/Facebook levels of time and engagement. What’s driving growth? Having a platform like Facebook with 500mm. Ben mentions the “K-factor” which is a graphing term applied by epidemiology to describe a viral effect. How to respect the consumer? Playdom won’t short their user by popping up pre-rolls and banners to interrupt. Google competing with Skype & Microsoft? Last week’s round-up included mention of Gmail’s voice calling capabilities, making it a telephony & Skype market disrupter. This week, it’s all about lowering the switching barriers on your current email services, like Microsoft’s Outlook and RIM’s mobile email client, through removing inbox-overload pain. Read more: Gmail just got a whole lot smarter with Priority Inbox – an adaptive algorithm that aids in identifying urgent priority emails, and helps to cut down on “insignificant email” reading time. Competing for time/SocialNetworking value: Apple’s new Ping rocks out as it allows you to see what music your friends are digging, as well as connect with your favorite music artists and see what they’re tuned into. Preview: Apple’s Ping Music Social Network In Action on iOS. Any big market news I missed from last week? Post it in comments below. John Battelle, CEO of FederatedMedia and a long list of pioneering publications and books on new media and Search, posted about how he “blew it on Facebook” by exceeding the platform’s Friend limit of 5000. He goes on to comment about how his use of the platform has changed and a little about what the nature of friends are. In this post I’ll share some thoughts on these issues and about how I use Facebook. Your privacy is in your control. In other words, you can worry a little less about who friends you and if you have “to quit them” or not. I’ve had quite a few conversations with clients and friends that hail back to a previous post where I proposed a Social Spectrum. The post was in reaction to technical shortcomings for filtering and creating dynamic privacy–the situational rules you create for “you on display”–on SocialNetworks. Better tools are emerging, but they remain largely hidden and “opt-in” by nature. You have to actively place rules on your media SocialMedia, but it can be done. The premise behind the original post was that everyone enters SocialMedia from different perspectives and experiences, around a variety of media and interests, with different expectations and comfort-levels about revealing parts of themselves to others and, ultimately, to the search cloud. There are cultural, gender and age divisions that inform how active and open you might be as you approach and develop SocialMedia competencies. Me: I realized after friending several people in the organization that not everyone’s comfortable with connecting on Facebook. Most prefer LinkedIn for professional connects. Her: Yeah, you’re still sitting in my pending list. I’m expecting a lecture. Me: The lecture is mine. I should ask if there’s an interest in connecting in the invitiation message. Go ahead and delete. We’ll find other ways to share that you’re more comfortable with. Some senior-level newbies to SocialNets are concerned by the appearance of intimacy and access beyond what they would allow in real life (IRL). Some, fresh out of college, are used to friending quickly but think twice when a tagged photo hits their socialgraph from a college friend. They haven’t had to modulate between friends and colleagues before. Some opt-out, ignore or block access to their socialgraph risking professional embarrassment of a lesser nature. Redefining their Social Spectrum becomes an active effort. For myself, I follow the same rules I would IRL: I have appropriate and clear boundaries. I don’t accept friends or associates that I wouldn’t run into IRL through one of my many interests. I block when someone or something becomes inappropriate as you would expect. Unlike IRL, I don’t have to listen to an overly chatty person (which some have accused me of being based on an active twitterstream, btw). The great news is that technology offers you the ability to filter content and even people. Twitter reader/management applications like TweetDeck and DestroyTwitter allow you to group the people you want to hear from most. 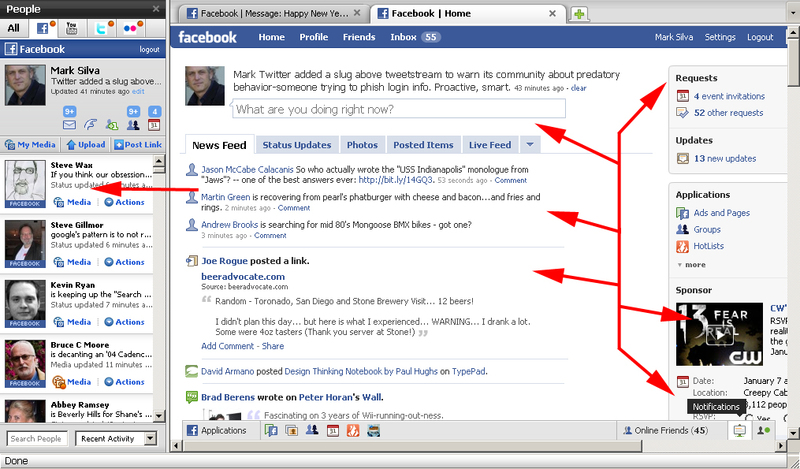 Facebook has added a “like” link on each item that shows up in your SocialGraph which will eventually optimize people and topics you like to see most from you friends. And, with a little work, you can also tune your Facebook settings to hear the right signal-to-noise for anyone or thing. As Facebook connect becomes more widespread you’ll be able to take these same privacy settings with you out in the wild of the web. Below is a great tutorial on the subject. Enjoy and let us know what else you use for filtering in the comments. Twitter alerts users to an emerging issue. This weekend a Phishing scam erupted around Facebook and Twitter. For those fortunate enough to have not been introduced, Phishing is the act of acquiring someone’s information by misrepresentation as a trusted entity. In this case people received email messages from their friends’ Twitter or Facebook accounts who had been duped by the scam, clicked to a site that looked like your Facebook or Twitter login page and entered their name and passwords. Then all their friends got direct-messaged and solicited and so on. If it got you, don’t feel too badly; even some of the most experienced get scammed sometimes. Did they have to go to these lengths for their community? These issues come and go so quickly most people wouldn’t notice. To this point, the message was gone a couple of hours later. And, think about what it takes to make a change on your corporate website. Now consider what it takes to change the User Interface of a webservices application. Nothing changes that doesn’t absolutely have to. So to answer the question above, Twitter clearly felt they needed to do something for their community and brand. I thought it was interesting that the community was also helping out on Twitter–and therefore in Facebook for those that update their Facebook Status with Twitter–by warning others of the threat. In a way, Twitter can counter viral activity because its citizens wish to keep it pure. In a way, it’s the “diseconomy” or “deviralization” of a person or issue at work. 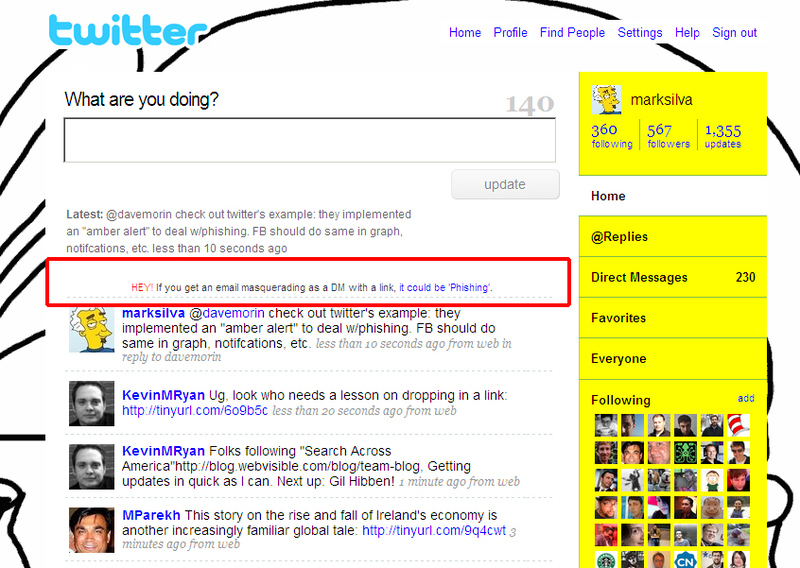 There are those that believe Multi-Level Marketers can better exploit a platform like Twitter, but I disagree. The community will gang up against exploitive behavior faster than it can regenerate. Protip: If you think something’s not right on Twitter you can also “Follow” @spam to direct-message them with suspicious activities or accounts. They’re great at removing the weeds and debris from their garden and rely on the crowd to help with vigilance. How Facebook could have responded to Phishing scam. Meanwhile, the silence at Facebook was telling. By my count and without altering their current message carriers Facebook could have warned its community in half a dozen intuitive ways. In its socialgraph, inbox, activity notification bar, status feeds, profile alerts and even in its ad space it could have notified users of the emerging issue. Instead, it acted more like a large, traditional institution that either can’t marshall the resources and authorizations to react in real-time or won’t as a matter of policy. I’d say for this round, Twitter acted more like the Real Brand and served a good lesson in brand-as-service for its larger SocialMedia bretheren. Here’s a good link if you want to take your own precautions against Phish feeding, courtesy of Twitter. Update: Brittany Spears gets hacked on Twitter by the Physhing scam. What followed surprised me: within 12 hours 18 others added their quotes–more comments than my FB posts usually get; their socialgraph represents 3641 people and inspired another 23 comments. I didn’t crawl their comments to see the network effect in added reach, but if we use the averages based on mine, the echo would include another 9300 in reach. With an average friend duplication of 7.75% you still reach over 10,000 people per post in the first two generations of the meme. Because the active socialgraph/profile will bury this meme, it needs to reappear at different times, which it does as others replicate and comment. I expect to see this meme come back around many times in the coming months. More surprising is that this isn’t even a Facebook application. It’s an activity that’s as catchy as an application but relies on The Groundswell to crawl all the SocialNetwork’s carriers to produce the Metacalfe effect. So, without any programming and low-production content you can create a viral campaign by following the best practices of The Book Quote Game. Check out this page. It’s content right? This is the Election ’08 page on Facebook. 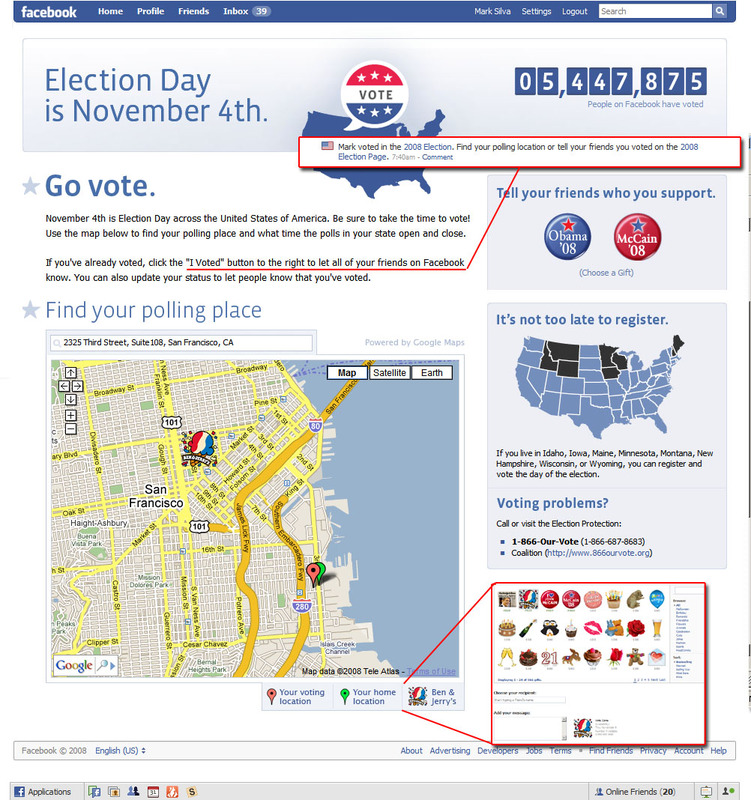 It’s got your voting booth location mash-up powered by Google Maps, some info graphics and even a gift/badge for you to wear your colors–Red or Blue. It showed volumes in real-time as people clicked the “I voted” link on their Facebook profile page after visiting the polls. I tweeted about the page in the morning of election day when 1.1 million people had already been counted and watched the numbers swell each hour until the polls closed. Nearly 5.5 million acted making it one of the highest daily-use apps to date (think about how few YouTube videos get that much play in a single day, let alone month for comparison). The genius is in the Ben & Jerry’s map/application integration. This is content, but it’s also a delivery mechanism for the advertising sponsorship by Ben & Jerry. Simple. Natural (as in additive and not interruptive). Brilliant. In this case you were able to find the local Ben & Jerry’s store to get the free icecream cone they were offering for those that voted IRL and in the integrated link you could also send a “vote cone” virtual gift to your friends in Facebook. For Ben & Jerry’s it’s a win across the board. The association is perfect for a brand that has in its roots social change and political activision. That future analysis will likely attribute SocialMedia and Facebook’s influence on 14mm new young voters heavily skewed to Obama as a determing factor in the race can’t hurt the brand. And the message was party-neutral regardless of the results. These are the kind of brand-fit filters every connection planner should find: Content, Context and mission. As a campaign tracking mechanism, free cone redemptions will be an easy metric. Virtual gift talleys will also be telling as will traffic to the Election ’08 page. Without a doubt, Buzzmetrics and other influence trackers will be tallying total blog mentions and related viewership. And, I’d love to see the total impressions this campaign earned from the SocialGraph as well. We’ll reach out to Facebook, the brand and related agencies to see if we can get the numbers. And, if you’re related to the brand and know, feel free to share below. Ben & Jerry’s won big on this campaign–even before all the numbers are in–by hitting the right tone of placement and pitch. I learned about new retail locations in a relevant way. I also didn’t feel like they were selling me. In fact, they were offering a number of value-exchanges I couldn’t get without them entering my social interactions on Facebook. Consider how different this is from the “Market Stall” approach of fast and casual food retail where the strategy based on ad spend (shout louder, sooner and with a better offer than your competitors) dominates their consumer communications. The Market Stall has 90%+ of ad spend concentrated on TV and traditional media in a cluttered, interruptive market place. Ben & Jerry’s essentially opened a new market away from the noise, clutter and lack of relevance of the traditional approach. Every brand marketer should be asking themselves and their agencies: What’s our occasion(s) that should be so integrated with Facebook? And then buy the date to lock out your competition and outplay them. Added: was reminded that I previously posted about Lee LeFever’s Common Craft show, “SocialMedia in Plain English” and it was the metaphor told via Ice Cream retail. Fun conincidence. All our SM Answers Haz Ice Cream.